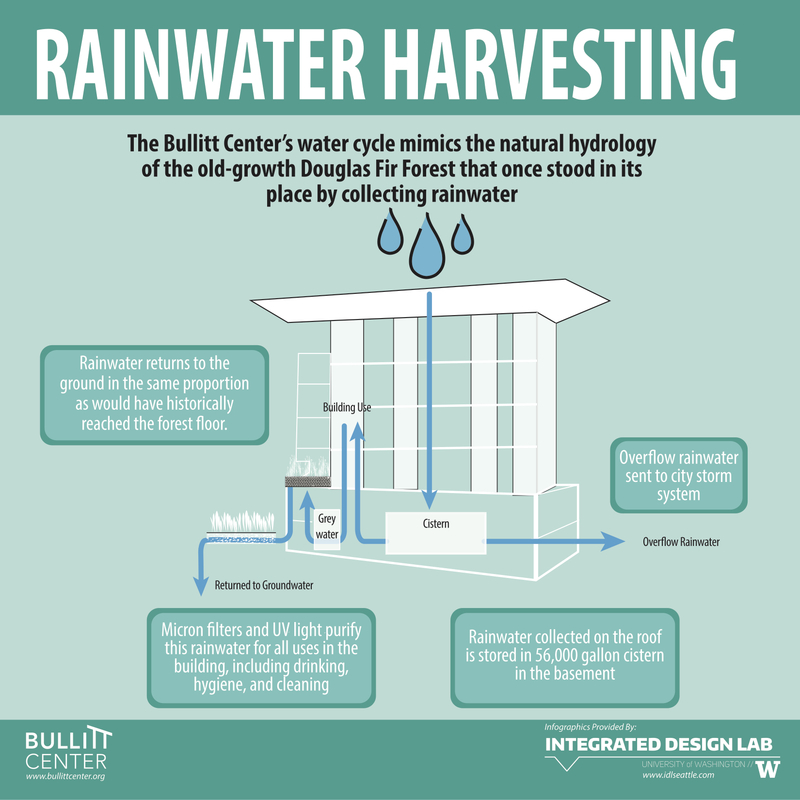 Like a Doug fir forest, the Bullitt Center returns water to the soil and atmosphere. The building will restore the historical relationship of water to the land by collecting rain, returning it to the earth and the atmosphere. 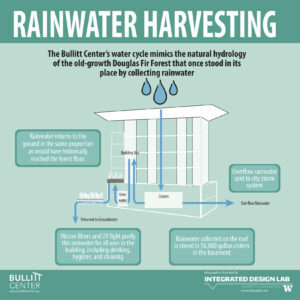 61% of the water in a Douglas fir forest evaporates or infiltrates into the ground, similar to the grey-water treatment in the Bullitt Center. The Bullitt Center is designed to help restore the ecological processes of the site back to they way they functioned hundreds of years ago when it was a Douglas fir forest. Like a forest, the Bullitt Center must use only the water it can collect onsite. Below the solar panels, a parapet roof captures rainwater and brings it to downspouts that carry the water to a 56,000-gallon, concrete cistern in the basement. On its way down, the water is funneled through a vortex filter, which removes large particulates. Next to the cistern is a “day-use tank” that holds 500 gallons of clean, potable water. To create the potable water, the rainwater is “ultra-filtered” through three ceramic filters, with the finest removing viruses. The rainwater is also passed under ultraviolet light and through activated charcoal and a small amount of chlorine is added. While chlorine is a toxic chemical, research showed examples of people getting sick from bacterial growth on faucet heads, so the team decided to use a small amount of chlorine – then remove it at the faucet head with activated charcoal – to protect public health. The rainwater harvesting is one of the final legal hurdles the Bullitt Center team must clear in order to be “net-zero” water. The Bullitt Center is fully plumbed to provide its own water, but until regulators give final approval, water will be from the municipal water source.